Trivandrum, 1 June 2012: Indians will get a chance to view the celestial event 'Transit of Venus' on June 6, 2012. Transit of Venus is a rare celestial event in which the planet Venus will be directly between the sun and the earth. The event will be visible from sunrise till 10:30 am in the morning on that day in which the planet will be seen as a black dot moving across the face of the sun. Venus will be about 30 times smaller than that of the sun. The Transit of Venus comes in a pair, separated by eight years. 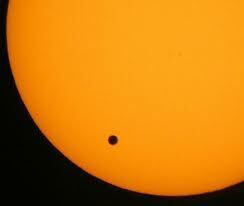 The last transit of Venus was seen on June 8, 2004, followed by the subsequent transit this year. The next pair of transits will take place after 105 years, on December 11, 2117 and December 8, 2125. The last pair appeared 121 years ago on December 9, 1874 and December 6, 1882. The 2012 transit will be visible from the Pacific Ocean—including Hawai, northwestern North America, northern Asia, Japan, Korea, New Zealand, eastern Australia and the Pacific islands. Most of North America and northwestern South America will be able to see the start of the transit before sunset, while southern Asia, the Middle East, eastern Africa, western Australia, and most of Europe will be able to observe the end of the transit as the Sun rises. In India the transit can be viewed from almost all places starting from Assam at 4:15 am. Precaution should be taken in watching the transit. The safest way to observe a transit is to project the image of the Sun through a telescope, binoculars, or pinhole onto a screen. It can also be viewed using the naked eye with proper filters. The event will also be webcasted live by Nehru Planetarium on its official website nehruplanetarium.org .